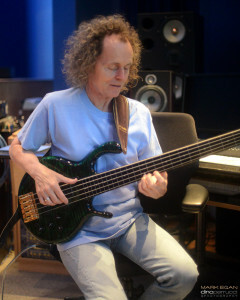 Since touring and recording in the late ‘70s as a member of Pat Metheny Group, Egan’s ability to groove, perfectly complement the music in any situation and solo in highly expressive fashion has made him one of the most in-demand bass players on the international music scene. While racking up credits with the Gil Evans Orchestra, saxophonists Steve Grossman, Stan Getz, Sonny Fortune and Bill Evans, vocalist Michael Franks, guitarists Pat Martino, Larry Coryell, John McLaughlin, Alex De Grassi, John Abercrombie, Chuck Loeb and Vic Juris as well as such pop stars as Sting, Joan Osborne, Sophie B. Hawkins, Roger Daltrey and the Duran Duran off-shoot group Arcadia, Egan also went about documenting his singular fretless bass guitar voice in a series of recordings as a leader, beginning with his 1985 bass manifesto, Mosaic (which both Gottlieb and Forman appeared on). He and Gottlieb, who were schoolmates during the early ‘70s at the University of Miami, formed the group Elements in 1982. Egan continues to play with a Gil Evans Monday Night Orchestra reunion band led by keyboardist Pete Levin. Bo rn in Brockton, Massachusetts in 1951, Egan began his musical studies on trumpet at the age of 10, mainly through the influence of his father, who was an avid player. He continued to play the trumpet through high school in jazz bands, R&B groups and the high school orchestra before picking up the electric bass at age 16. Egan subsequently enrolled at the University of Miami School of Music as a trumpet player, under the direction of Jerry Coker and Whit Sidener, and studied privately with the late, great Jaco Pastorius, whose influence remains with him to this day. 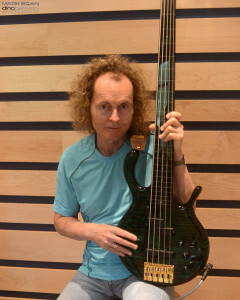 “When I heard Jaco play it made me aware of what could be acheived on the electric bass,” says Egan. “Jaco was an innovator and to be in his presence was uplifting and inspiring during those early years.” While in Florida, Mark performed with many of Miami’s talented players including the multi instrumentalist, Ira Sullivan. In 1975 Mark formed a band with fellow University of Miami students Clifford Carter (keyboards), Hiram Bullock (guitar), Billy Bowker (drums) and Phyllis Hyman (vocals). They came to New York in 1976 and soon afterward Egan hooked up with the Pointer Sisters, Deodato and David Sanborn before joining Pat Metheny in 1977 along with drummer Danny Gottlieb. Together they recorded the influential Metheny albums Pat Metheny Group (1978) and American Garage (1980). It was through this association that Mark would later team up with Gottlieb to form the band Elements, an uncompromising, genre-bending group that has 13 recordings to date and has toured in over 27 countries. Direction Home is scheduled for a March 2015 release on Egan’s Wavetone Records label.